Lithograph printed in brown and black, a fine, fresh impression of the only known state, the full sheet, printed on Fabriano Italia paper, nearly to the edges, hand-signed and numbered in pencil by the artist, executed in an edition of 59 (there were also 9 Artist's Proofs), printed by Kenneth Tyler at Gemini G.E.L, Los Angeles, published by Gemini G.E.L., Los Angeles, in very fine condition, framed. Berswordt-Wallrabe, Silke von with David Galloway and Virginie de Bermond-Gettle. 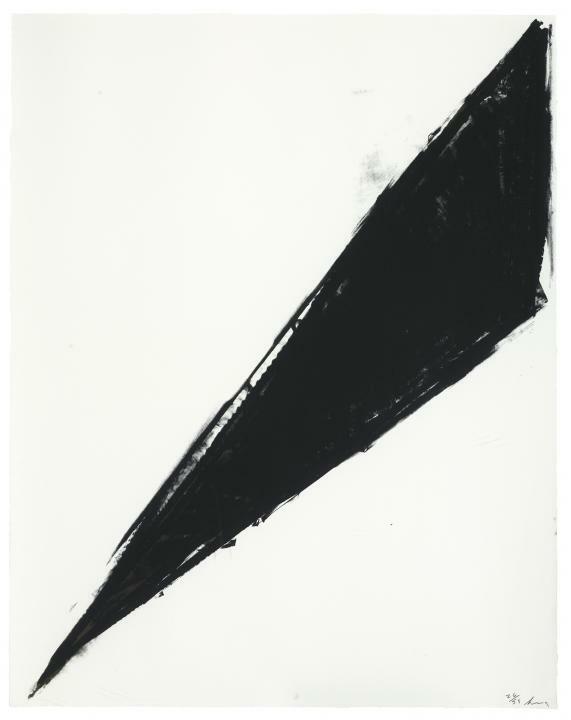 Richard Serra Druckgrafik, Prints, Estampes, Catalogue Raisonné, 1972-1999. 1999, Galerie m Bochum and Richter Verlag Dusseldorf, p.59, illustrated (presumably another example), also p.107, no.CR 4, illustrated (presumably another example). The Gemini reference for this work is 47.4.